Whether the thought of taking off on a cross-country road trip invokes feelings of excitement or those of dread, there are things you can do to make the experience more enjoyable for all travelers - including the kids. You don't have to spend a lot of money to make the trip fun, but you do have to do a little planning. Want more road trip tips? Sometimes the goal is to just get in the car and drive with stops only to fill the tank. Other times you may want to get out of the car to smell the roses (or visit a giant ball of twine). For people looking to get out of their car and explore some stops on their journey, RoadTrippers.com lets you put in your starting and ending address and then uses that information to give you options for stopping along the way. The GasBuddy app (or GasBuddy.com) can help locate the cheapest gas near your current location. They also have reviews of gas stations (and their restrooms!) and a handy trip calculator that can help you estimate your expenses. Apps like Waze or Google Maps can alert you and help find an alternate route if there are any traffic accidents or construction ahead. It is easy for small spaces like a car to quickly become overwhelmed with stuff. Try some of these organization road trip tips to not only help keep your car clean but also help keep activities in reach of those in the back seat. Hang a plastic grocery bag and use that for trash. If you don't have any hooks in your car that will work, try using a carabiner clip attached to a headrest or a Command Hook to keep the bag upright. Another idea is to use a plastic container, like those designed for cereal, as a trashcan. Line it with a grocery sack and you have an easy-to-use trashcan with a lid. You can find ready-made car organizers like these or, if you want something more custom, you can use over-the-door shoe holders or you can even sew your own. Kids love to build tents in the house, over furniture, tied around chairs and tied onto doorknobs. Why not let them try it in the car? As long as the driver can still see over the tent, let the kids have their own little clubhouse while you drive. Instead of focusing on negative behavior, try to reward good behavior instead, like this mom. 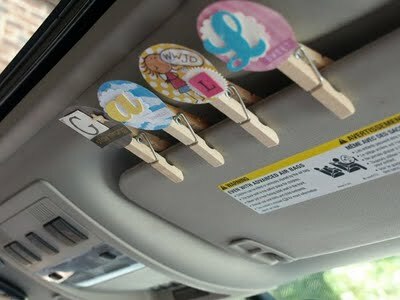 She made a decorative clothespin for each of her children and put them on the car visor. As long as they behaved in the car, the clip stayed up. If they misbehaved they'd miss out on the next fun thing like getting a treat at the next stop. She managed to only have to take down a clip once in 32 hours of driving with 4 kids. Impressive. Create a mailbox area in the car in a convenient location where messages can be passed. Write a message, put it in the mailbox, and then let someone else "check the mail" and find their letter. They can write a reply and send it back. Take the trivia cards out of your trivia board game and just ask the questions without the board. Make up game show style questions about yourself. "Five answers on the board, one person surveyed and the question is: what are mom's five favorite TV shows?" Get The Kids' Book of Questions or Table Topics cards (there's also an app). Let the kids read the questions and answer them together. Be prepared for some of the answers to questions such as "What one thing would you change about your parents if you could?" Washable Window Markers or dry erase markers are fun to use on the inside windows and will wipe off easily. Play games like tic-tac-toe or hangman, draw pictures or write messages to other cars. Mommy's Bag of Tricks is sort of like Tinker Bell gifts. Basically, its a selection of items - some cheap and some not - that you can pull out at regular intervals to help break up long stretches in the car. It can be random things like pipe cleaners, a snack, a workbook, a Klutz book, etc. Pacing it at about once an hour seems to work better than giving them several things at once and then having them say "now what?" When the sun goes down, the number of entertainment options goes down. Provide each (non-driving) person with a book light so they can see even when it's dark outside. 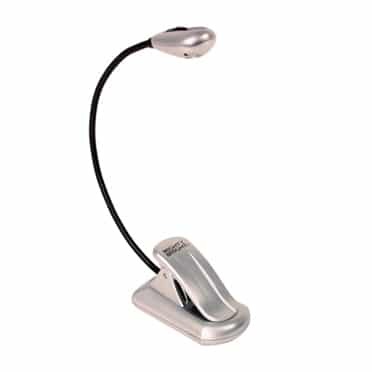 Mighty Bright lights are a good choice they provide good light and are easy to clip onto books or the seat. Also fun in the dark - or anytime - are glow sticks. Even after the kids have finished playing with them, they can be hung up and used as a kind of a nightlight while the kids are sleeping. You can find glow sticks online or at your local Dollar Store. Electronics can be a fantastic diversion but when you've got a lot of time together, you have plenty of opportunity for non-gadgety activities as well. The ol' classic alphabet game - somebody starts with the letter A and has to find something with that letter on it and then it's the next person's turn to find something with a B and so on. Dairy Queen, QuikTrip and zoo signs are your friend. Tell a story, one word at a time. The first person starts and says a word, then the next person adds to it and you just go around and around until the story is too ridiculous to continue. Road trip bingo - you've probably seen the play cards but it's basically pictures of things you'd see while road tripping and everybody tries to find those items and get a bingo on their card. No need to buy the bingo cards; you can print them at home. WDW Prep School has an entire Pinterest board dedicated to road trip tips, so be sure to follow us there to get new ideas as well. We love the license plate game. People come from all over to go to Disney so there’s a real chance at getting all 50 states. Also, I keep gallon size ziplocks at each kid’s seats…in case of car sickness. Helps contain the odor until we can dispose of the bag. Sea bands and kids Dramamine are good to have on hand. First of all, I love your site! Another game/ activity that I have done is to make an I Spy jar. I washed out a clear coffee jar with a screw on lid, filled it not quite full with white rice and added about 25-30 small objects for them to spy. Things like army men, a paperclip, small plastic farm animals or dinosaurs, etc. Also, I love the window marker idea! My husband and I have taken our daughter (who is now 3) on several road-trips. Most recently we went to Philadelphia over Labor Day Weekend. Our number one thing is to leave at night. We leave just after dinner time and start the drive. For us, driving at night is no big deal and the bulk of the driving is done while our daughter is asleep. Now I know this is not for everyone, but it makes it so much easier when she sleeps all night! My friend just got back from their 24 road trip – yikes! She had an idea similar to #8. She wrapped little items, and every hour, on the hour, gave them to the kids. This way they did not get bored with the items they brought, and had fun guessing what would be next! On another note, do you think we could use those window markers on a plane? 🙂 Probably not, but it might be fun!